Convert PDF To Word In 3 Clicks! Editable - Edit Your PDF Documents In MS Word! Easily - Convert PDF To Word Document Just In Only 3 Clicks. 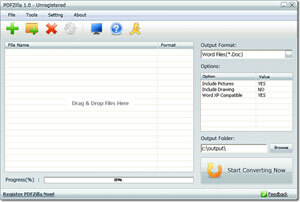 High Quality - Convert PDF To Word with ALL text and Graphical Data. Page Selection - Convert Selected Pages of PDF File To Word document. Over 20 Languages Supported - Besides English, PDFZilla Also supports German, French, Spanish, Italian and all Unicode Language PDF Files. Batch Mode - Convert 1,000+ PDF Files in Bulk. Convert PDF To Word Now! 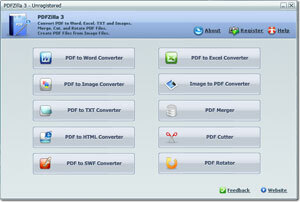 Learn How to Convert PDF to Word, Excel and Images etc. MS Word(*.DOC), MS Excel(*.XLS), Plain Text(*.txt), Rich Text(*.RTF), JPEG(*.JPG), GIF(*.GIF), PNG(*.PNG), TIFF(*.TIF), Bitmap(*.BMP), Flash(*.SWF), Webpage(*.HTML). JPEG(*.JPG), GIF(*.GIF), PNG(*.PNG), TIFF(*.TIF), Bitmap(*.BMP), Photoshop(*.PSD), Icon(*.ico), PPM(*.PPM), TGA(*.tga). An integral characteristic of good software is its user-friendliness. A manifestation of this trait is the numerous languages that the program supports. 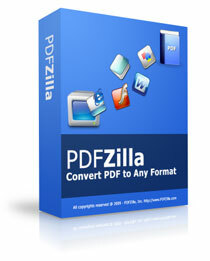 PDFZilla is available in numerous languages such as French, German, Italian, and Spanish. There's no doubt about the strength, speed, and reliability of PDFZilla. It surely is an innovation that will wreak havoc in the world of PDF converting.